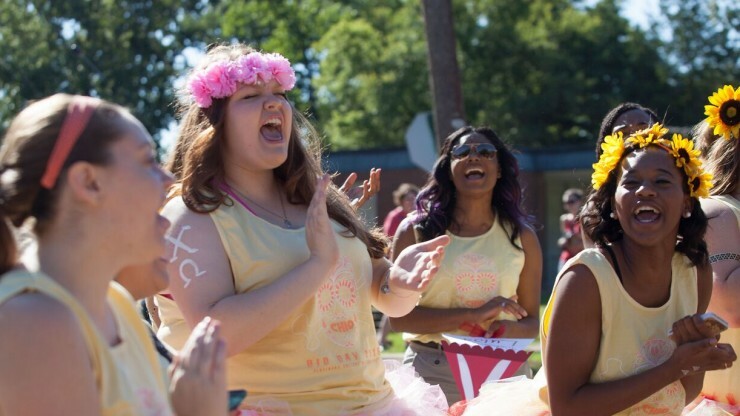 Put aside any preconceived notions about what it means to "be Greek" on a college campus. At Centenary, the Greek experience extends far beyond social events. Greek organizations (fraternities and sororities) have maintained a presence at Centenary for many years and have dedicated themselves to excelling at the Four Pillars of Greek Life: leadership, academics/scholarship, service/philanthropy, and brotherhood and sisterhood. Many students find a second home in the Greek community, meeting people who share their goals, values, passions, and ideals. Formal recruitment for Greek organizations at Centenary takes place during the first full week of classes in the fall semester, but there are opportunities for incoming students to interact with Greek students and advisors during both the SOAR and orientation programs. Each Greek organization at Centenary embodies the Four Pillars in a unique way - learn more below and see if one feels right for you! View the Greek Life information booklet for more information about recruitment below. The National Panhellenic Conference, one of the largest organizations advocating for women, is the umbrella group for 26 national and international sororities that are autonomous social organizations. Our women's organizations, Chi Omega and Zeta Tau Alpha are both members of the National Panhellenic Conference. The Panhellenic board will organize recruitment and help new members with the recruitment process. Click here to download Panhellenic Financial Costs for 2018-19. Sign up for Fall Recruitment! Registration is now open.